Our sweet puppies / dogs are often our best friends. Treat them like they're family by getting them an extra soft personalized blanket to sleep on! These dog blankets come in two different sizes Regular (approx 40"W x 30"H) and Large (60"W x 50"H). They are the perfect size for them to curl up on top of or underneath. The material is a smooth minky fleece that is extremely soft to the touch. 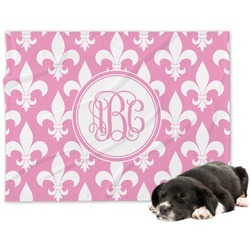 You can either personalize both sides with matching or completely different designs! Easily throw the blanket into the washer after any doggy messes. Choose from thousands of backgrounds and graphics to start your design. Change anything from the fonts, to the ribbons, to the frames! You can even upload a picture or design of your own. Just give it some canine personality! If you ever need help in our design center just give us a call. We are always happy to help.